As with many who count Marion Cunningham as mentor, she came to me as if by divine intervention when I most needed guidance. In my case, the first apparition was in the form of a book and press kit at my front door in the fall of 1995. I was the mother of teen- and college-age children when I decided to become a food stylist. Actually, it wasn't quite that well thought out; it was more of a midlife reckoning. At any rate, I was casting about when my novelist friend Lisa suggested I become a food stylist for touring cookbook authors. "It's easy," she said, "you bake an apple pie; you take it to the studio; they film the segment; you take the pie home." She immediately phoned her sister who worked at the Random House West Coast publicity office (back in the day when there was such a thing) and who promptly threw cold water on the idea. "Oh, that never happens. We never need food stylists." The call came within two weeks. Could I prepare all the food for a news show featuring Marion and her new book Cooking with Children? Not just an apple pie, but all the components for Marion to teach kids to make the pie, plus a second segment on salads. And by the way, could we also have a buffet table filled with other recipes from the book for the camera to pan as a "bumper." I still wonder sometimes at my brio tackling that first job, figuring that my past experience as a mom and self-taught cooking school director would see me through. That's when the book and press kit arrived. I read Marion's bio -- a woman of a certain age bumping into her destiny when and where she least expected. Here was the exemplary tale, marketing fluff aside, of a woman who had reinvented herself when most would say it's too late, you're too old, and who dared to do something new because somewhere in her, despite her fears and shyness, she had the confidence she could figure it out if she just applied herself. Not only that, she was touting everything I believed in about the importance of cooking at home. Marion launched my career that day. It may have been kind exaggeration or perhaps she recognized the signs of an earnest not-so-young woman trying to find her way, but Marion sang my praises to Random House. Steady work started coming my way and along with it the opportunity to listen and learn from many great food writers. After that first job, Marion and I worked together whenever she came to Los Angeles (she pronounced it the old-fashioned way, with a hard "g"). Over Sunday suppers at Lucques Restaurant, she encouraged my writing. I think she enjoyed finding someone of like mind who walked the walk of getting family dinners on the table. And when Marion enjoyed your company, she'd invite you to visit if ever you found yourself in Walnut Creek. I stayed several times in the little guest house that overlooked golden fields of winter mustard. During the day, I'd write or help her test recipes, sometimes along with whoever else was visiting. I learned a lot about recipe testing in Marion's kitchen, which has served me well since. In the evening, we'd jump into her sleek jag to dine in Berkeley or try out Traci du Jardin's new place in San Francisco or eat at Judy Rogers' Zuni Café. If you want to pick up the tab at a restaurant, quietly hand your credit card to the hostess or maître d' when you arrive. Open your home to friends and don't be afraid to serve them a simple meal. In fact, don't confuse home cooking with restaurant cheffing. If you think you have to cook like a chef at home, you'll work yourself into a lather and won't do it at all. 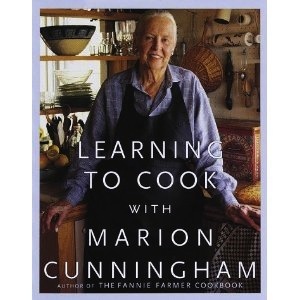 Marion's philosophy gave me the courage to invite her over for a simple roast chicken school-night dinner that I prepared while Fannie Farmer herself sat in my kitchen and chatted. Always keep Ziploc bags of homemade cookies in the freezer, just in case. Butter makes everything better. Marion's Raised Waffles may be her most enduring recipe, but it's not the two kinds of leavening that make them worthy; it's the stick of melted butter in the batter. And BTW, if you're going to make waffles, invest in two irons--the simple kind from the hardware store with the small grids--so you can turn out lots of hot waffles at once like Marion did. And be sure to serve them with additional room-temperature salted butter and warm syrup. Encourage beginning cooks. In the years I knew Marion, she was passionate about helping adults overcome their fears in the kitchen. She taught beginner-only adult cooking classes and used those experiences to write Learning to Cook, a very basic but delicious cookbook. She was always trying to figure out how to change her teaching and writing so a novice cook would feel empowered to succeed, not intimidated to fail. Her goal was to get people into the kitchen, not to show off her pedigree. I've never forgotten that lesson.